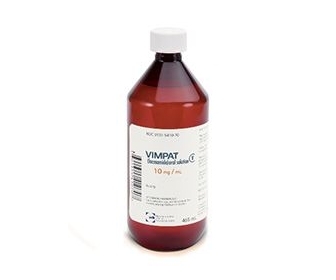 VIMPAT (lacosamide) is a medicine that is used with other medicines to treat partial onset seizures in patients 17 years of age and older with epilepsy. VIMPAT is generally well-tolerated, but may not be for everyone. Ask your doctor if VIMPAT is right for you. VIMPAT may also cause problems with coordination and balance. You should not drive, operate machinery or do other dangerous activities until you know how VIMPAT affects you. Do not stop taking VIMPAT without first talking to your doctor. Stopping VIMPAT suddenly can cause serious problems. VIMPAT could make you feel faint. Tell your doctor if you have a heart condition or if you are taking other medicines that affect the heart. In rare cases, VIMPAT may cause reactions that could affect your heart, liver or kidney. Contact your doctor immediately if you are tired, have jaundice (yellowing of skin or eyes), and have dark urine. Antiepileptic drugs, including VIMPAT, may cause suicidal thoughts or actions in a very small number of people, about 1 in 500. Call your healthcare provider right away if you have new or worsening symptoms of depression, any unusual changes in mood or behavior, or suicidal thoughts, behavior, or thoughts about self harm that you have never had before or may be worse than before. Adding another epilepsy medicine to your current treatment can help you better control your partial-onset seizures. That is why you and your neurologist have added Vimpat―a medicine that treats epilepsy.